WHY? But WHY? Often this is the most confusing and heart-rending of all questions. Why? Because it is very often unaswerable...and that's the rub! Why represents our helplessness in the face of life in a fallen world, doesn't it? The last question in our study begins with this word, Why? Why does the Lord want to be invited into our "stuff?" And then, of course, He calmed the storm and took them to the shore. Did you see it? with! Oh that wonderful word, with! ** How I love it! What that little word says to my heart is that Jesus wants me to experience Him with me at all times, in every situation. That makes me think of my mother-in-law, who is in a retirement community. In recent years, she has had to move into increasing levels of care. Despite the excellent care and the loving attitudes of the staff, the residents there are often lonely, truly needy, and pathetic* (in the truest sense of the word). It's hard to go visit! When we go, we can't help but see many searching, "hungry" eyes...l ooking for someone to just be with them! And when I take my young grandsons there, many of the "seemingly dead-inside-people" come alive! 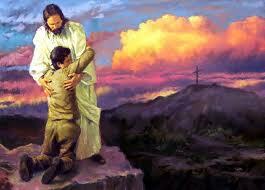 Friends, we are all, in reality, needy, weak, lonely, and pathetic*...but Jesus loves us anyway. He wants to be with us in our stuff! Are you experiencing the intimate with-ness of your Savior in your life and circumstances today? Invite Him! Urge (desire) Him! Open to Him! He's there! Do you ever feel like the Lord is asleep in your boat? He's in the situation, but He's silent. You are playing the waiting game! Take a look at another boat story in Mark 4:35-41. Thou art the Lord who slept upon the pillow, Thou art the Lord who soothed the furious sea, What matters beating wind and tossing billow If only we are in the boat with Thee? **for the 3 Greek words translated with see "Caught in the Web." Each has varying degrees of closeness. Prayer: WHAT blinds us to His Presence? Evan has been awake for 10 minutes and already has asked 30 questions. Yes I've been counting! The latest question, "do snakes have eyebrows?" no wonder my head explodes about 1:00 each day! Happy Monday!! Kids are full of questions...as every parent (and grandparent) knows. Why is that? It's because that by asking questions, children "learn life in this world!" What blinds us to the Lord's presence in our lives? When the disciples were out in the midst of the sea, at the darkest part of the night, winds and waves crashing upon their little boat...they were scared stiff! (Matthew 26) The Greek word here is tarasso, which means agitated, stirred up. It's a picturesque word, reflective of the agitated and stirred up waves and wind surrounding them! They were afraid and rightfully so!. Fear is a perfectly normal, human emotion in the face of danger and dread. I suspect that it may have been part of Jesus' own emotions in the Garden of Gethsemane, the night before He died (Hebrews 5:7-9). But as a result of the disciples' fear, they didn't recognize Him who was walking to them "on the chaos of their lives." That is, not until He spoke, "It is I, do not be afraid!" Then their tarasso fear turned to reverential awe, "Surely, You are the Son of God!" 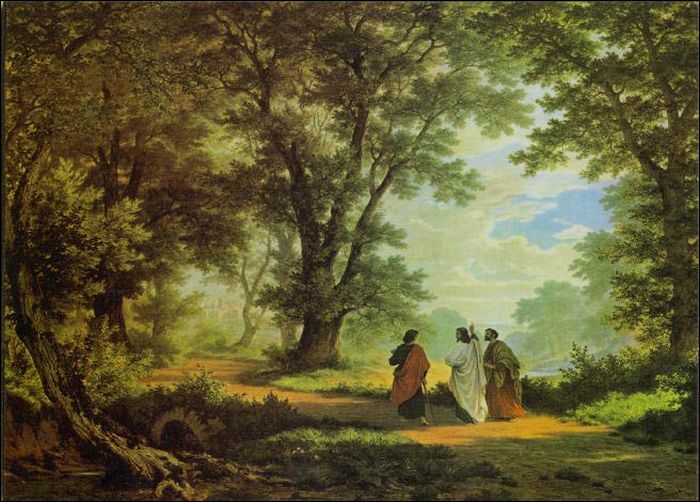 As the disciples were walking along, a Stranger approached them. In verse 16, it says that the disciples' "eyes were prevented from recognizing Him." Do you remember when they recognized the Stranger as their Lord Jesus Christ? That's right, it was at the "breaking of the bread," reminiscent of the supper the night before He died. Our passive voice again...so Who do you suppose did the opening? You got it again! The Father opened their eyes at just the right moment. It's so interesting to stop and think about how perfect God's timing was here. Their burning hearts (as the Lord had shared the Scriptures with them on the way) then gave way to open eyes! And these discouraged, confused, grieving Christ followers could then embrace the Resurrected Christ with a strong faith and tender hearts! This one is a no brainer. The sad state of this group of believers was caused by their own pride and self-sufficiency. They were wealthy and self-absorbed. They didn't need anything, because they had it all! And all of that blinded them to the Lord's presence in their midst. They had themselves in view...not Jesus! We often "strain at our own oars," thinking we have it in us to overcome our own dificulties and meet the demands of life. Then we find out we don't! We get scared...no, terrified at times! We are blind to our ever-present (in fact, indwelling) Source for all of life...our Lord Christ! It is I [I AM]! Do not be afraid! Open the door to me... invite Me in...I've been here all the time! 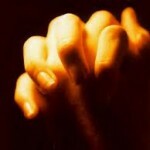 Prayer: WHO is responsible for our Circumstances? In my beginning ESOL class, I like to teach my students the basic question words early on in the school year. These question words are important for us in order to get information. And when we recognize them and use them correctly, we can have interesting conversations! Here they are...the 5W's & H: Who? What? When? Where? Why? and How? Maybe you noticed (or not) that we used three of these key question words in our Bible study from Part 2: Who? What? Why? WHO is responsible for the circumstances we find ourselves in? The short answer, GOD! He has sovereign control of the universe. Ultimately, if He doesn't ordain/allow it, it can't happen! (Deut 32:39) But at times there can also be other "agents" involved. Did you notice that in Matthew 14, it says that Jesus made the disciples get into the boat and go ahead of Him? (And ultimately they ended up out it the storm!) The Greek word for made is literally the word compel. He compelled them to get in the boat and go ahead of Him! Now in my thinking, compel is a strong word. So the disciples went into circumstances that were totally not of their choosing, but were absolutely God-ordained. In our last story, we see something totally different! We see circumstances that were caused by these believers own self-sufficient, prideful choices and attitudes. They thought they didn't need a thing...they had it all! And Jesus told them that they did't know how bankrupt they really were! So their circumstances were their own fault. But guess what? Jesus was there for them anyway...if they would just open the door! And that is good news for us! No matter whether our circumstances are purely beyond our control and totally God-ordained...or caused by other sinful men...or because of our own stupid, prideful choices...guess what? Jesus is there waiting to be invited in to our "boats"...to be urged to stay...to have our door opened to HIM! What are your circumstances today? Don't over-analyze it...open wide to Him! HE loves you and wants to be wanted by YOU! ...would respond to our cries! And not only that...He actually want us to cry out to Him and invite Him in! And it seems to me that becoming increasingly comfortable with mystery and paradox is a sign of growth in the Lord. We are okay with GOD being GOD! Now to the question that always comes to mind eventually: [Bonus Question from Part 2/ Now retitled PRAYER: urging...& opening... to better reflect the content]. Are there some things the Lord will NOT do unless asked? The short answer is, "I don't know!" Our persistent asking and seeking with good motives is important to God. See James 4:2 and Matthew 7:7-11. It seems to make a difference to Him! Even Jesus the Son didn't know some things...He only knew what the Father gave Him to know! Talk about astounding! This inability for us to know what God knows about prayer...or anything else for that matter...reminds me of a conversation between Lucy and Aslan [the Jesus figure] in Prince Caspianby CS Lewis. In Prince Caspian, sequel to The Lion, the Witch, and the Wardrobe, Lucy is the child that is in tune with Aslan...his voice and calling. She insists that she has seen him, though her siblings don't believe her. As a result, they all decide to not to act on Lucy's insights...with disastrous results! Lucy...I knew I saw you, but the others didn't believe me. Aslan..Why should that have made a difference? Lucy...Would all this NOT have happened if I would have come to you? Aslan...We can't knowwhat would have happened. But what WILL happen is another matter! Aslan...Of course! As will you! We can't know what would have happened if we had prayed. But what we do know is that God wants us to pray today...always...and somehow in His sovereign grace, HE puts it all together for HIS glory and OUR good (Romans 8:28-40)! * Keep in mind that we are talking primarily about prayers of petition. There are many other forms of prayer: worship, adoration, thanksgiving, confession, etc. What they all have in common, including petition, is atotal focus on the Lord! More Q & A next time...see you then!